The CC gets new front styling and more luxury equipment. Volkswagen plans to show its refreshed CC sedan with coupe styling at the Los Angeles auto show this month. The CC debuted as a 2009 model and is on the European Passat platform. Changes to the freshened 2013 model include new front and rear styling and a standard rear bench that seats three, replacing the two rear bucket seats on the current car. 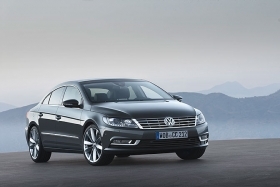 VW said the CC will have more luxury features as standard including fatigue detection and bi-xenon headlights. New optional safety systems will include a camera-based traffic sign detection system amd technology to warn of vehicles in blind spots and assist the driver in avoiding an accident by steering intervention. To improve fuel economy, all the available diesel engines are equipped with a stop-start system and battery regeneration mode for recovering braking energy as standard. All gasoline engines also have battery regeneration. VW said it has sold nearly 270,000 CCs since the car debuted. U.S. sales from 2008 through October have totaled 79,318, according to the Automotive News data center. In western Europe, VW sold 16,019 CCs in the first nine months of this year, according to JATO Dynamics. VW will launch the CC in Germany in February, then in stages across Europe, the United States, Russia and China.